Fitting Room:Check＆buy a player;s image, click costumes in the shop can view and try them on. Shopping trolley:Check＆buy selected items, select the purchase date or delete an item. Save image:Save current character image. Player can set the color of an item and follow the purchase dialogue box to buy. Palette:Choose color and skin complexion. Color Selection:Choose color of selected items. Apply to hat, glass, hat, facial decoration, clothes, and eyes only. There are 54 colors to choose from. Skin Complexion:Skin complexion can only be chosen along with eye color. There are 54 colors to choose from. Buy;Purchase items in the shopping trolley. Gift:Give all items in the shopping trolley to appointed player a gifts. Recommendation:Click and enter the Recommendation page. Weapons:Click and enter the Weapons page. Costumes:Click and enter the Costumes page. Beauty Products:Click and enter the Beauty Products page. Items:Click and enter the Items page. Free Redeem:Redeem items in the shop with vouchers and medals free of charge. Back:Check＆buy items on previous page. Next:Check＆buy items on next page. Attachment:Click "Add"to attach a file, can be used for trade or give away gifts. M:Check & buy costumes for male character. F;Check & buy costumes for male character. M:Check&buy beauty products for male character. F:Check&buy beauty products for female character. 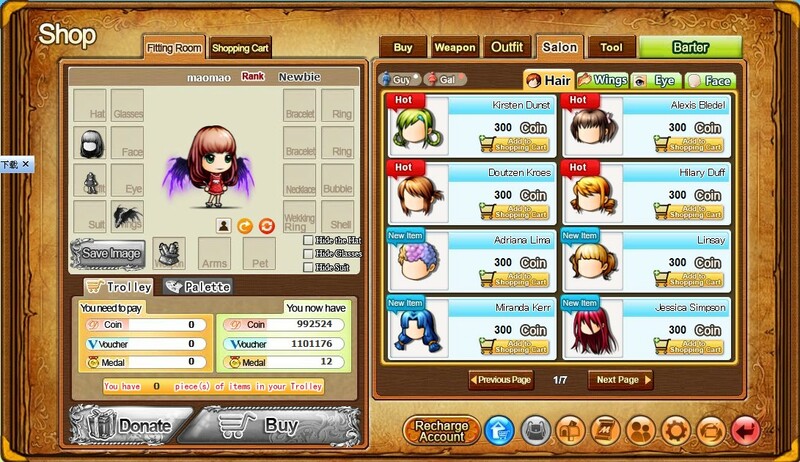 M:Check&buy items that can be equipped on male character. F:Check&buy items that can be equipped on female character. Voucher:Check&buy items that can be redeemed with vouchers. Special:Check&buy items that can be redeemed with medals. 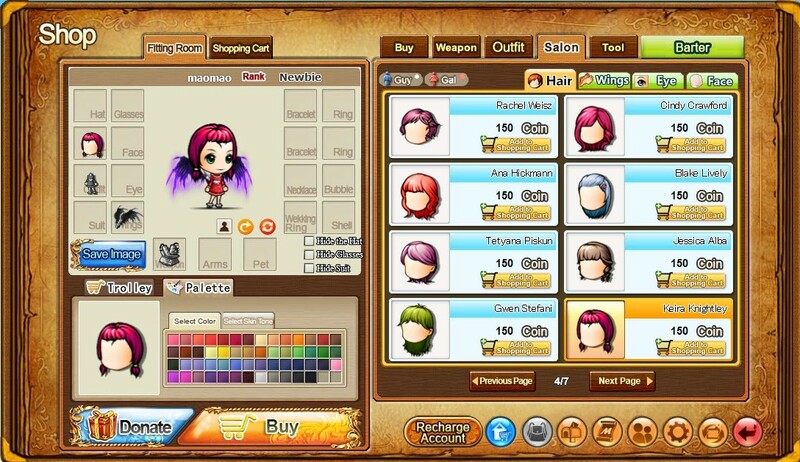 M:Check&buy free redeem items that can be equipped on male character. F:Check&buy free redeem items that can be equipped on female character.